Leading providers of Enneagram courses,consultations and business coaching in UK and overseas. Self-development specialists Chris Croft and Veronica Croft offer pioneering teachings about The Enneagram - a life-changing ancient wisdom that unravels the true nature of human behaviour and underpins and affects all aspects of our lives, whether we know of it or not. most importantly how it will transform your life and all your relationships. 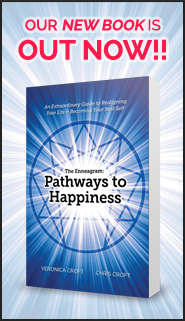 The Enneagram is the simplest and most effective route to better relationships, increased self-confidence and an easier life. It is a powerful catalyst for personal expansion, self-growth and happiness. Your personality type is the thread with which you have woven the tapestry of your life. The purpose of the Enneagram is to understand the nature of your life picture and to unravel the parts you wish were different and reweave them into a more beautiful picture. The best place to start if you really want to know more is to attend AWAKENING - our life-changing Enneagram Foundation Course.